- This route goes from a place not far from Tokyo to a place that's not far from Nagoya, so two of Japan's major cities are just a hop, skip and a train away. Just for the sake of argument, we'll assume you're actually interested in doing more rural cycling, so we'll concentrate on non-urban destinations. 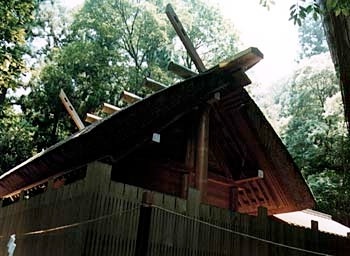 - ...Wakayama Prefecture. 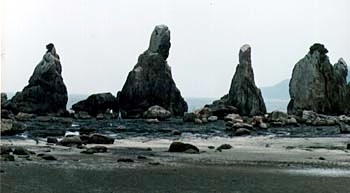 Many of the recommendations on the Koya trip "Alternatives" page are viable options for you here, particularly the trip that starts at Ise and goes down the coast (which will be on this site in the future) and the trip inland that goes as far as Wakayama (also coming up in the future). Needless to say, you could do these first and then ferry to Ise and do the Shizuoka route in reverse, or do the Shizuoka route as presented here and then continue on westward from Ise. Nevertheless, if you've followed KANcycling's advice to do this route west to east, you're likely to finish up in Shizuoka. This provides you with lots of options as well: Shizuoka is almost at the base of Mt. Fuji. You can cycle up part of Mt. Fuji to 2300 meters elevation (if you like puffing up hot dusty roads), and you can join half the population of Japan and climb further up to the summit at 3900 meters elevation (if you like trudging up hot dusty trails). Closer to ground level is Hikone, a very nice lake district that is home away from home for many of Tokyo's residents during Japan's muggy summers. If you want to get even closer to sea level (or at least sea location), the Izu Peninsula offers some wonderful scenic views as it curves around in the general direction of Yokohama, the southern end of the Tokyo megalopolis. If you want to extend your trip a LOT, you could go all the way along the Wakayama coast all the way back to Ise - the Pacific bikepath intends to do that eventually. However, "eventually" would also describe your arrival time; this is a long, LONG way. A middle option would be to start from Ise and ferry not to Irago but to the Hato-misaki on the smaller Minami-Chita Peninsula northwest along the coast from Irago, This smaller peninsula offers numerous beaches and an onsen on its western coast; although getting east from there through Hekinan looks to be a bit troublesome (involving going inland a bit), you would be rewarded by several more onsens as you go east and around toward Irago. One more alternative: normally, KANcycling doesn't make non-cycling recommendations. 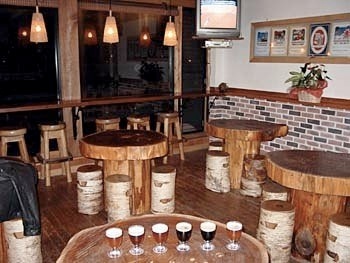 However, given the close, mystical relationship that exists between cycling and beer, we'd be remiss if we didn't tell you that one of Japan's finest microbreweries, Baird Beer, is located in Numazu, just east of Shimizu. There's nothing much in Numazu except for good fish and the Taproom, Baird's small brewery restaurant - but it's worth a stop just for those two items. Head straight down from the train station to the port (Numazu-ko): the Taproom is right across the street from the ferry ticket office. Smokers beware: it's a non-smoking pub; you have to step out on the terrace to light up. For more information, go to http://www.bairdbeer.com .